Did Carmageddon Make Way For a Baby Boom? The next time you’re stuck on one of the world’s busiest freeways, just think about those who are thrilled the 405 once came to a complete halt. “I am very happy Carmageddon happened,” said Michelle Souferian, who is due to give birth at Cedars-Sinai Medical Center any day. Well, not just any day: 40 weeks after the 405 freeway closed for the first time in 50 years for a construction project. Cedars-Sinai, where more babies are born west of the Mississippi than anywhere else in the country, worked exclusively with NBC 4 News to try and determine if there will be a post-Carmageddon uptick in the birthrate. Two couples were looking for something to do during Carmageddon. 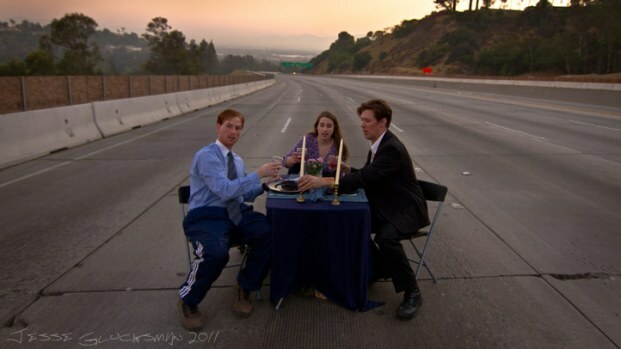 When the freeway shut down, they climbed a hill and hopped some fences... and set the table for a most memorable photo op. “Our prenatal classes are fuller than they often are, so it may be a premonition that there might be more women delivering nine months after Carmageddon,” said Dr. Sarah Kilpatrick, chair of the OB/GYN department. Carmageddon, the nickname for closing the 405 freeway from July 16 -18 last year, threatened to be a disaster of biblical proportions for car-crazy Los Angeles. 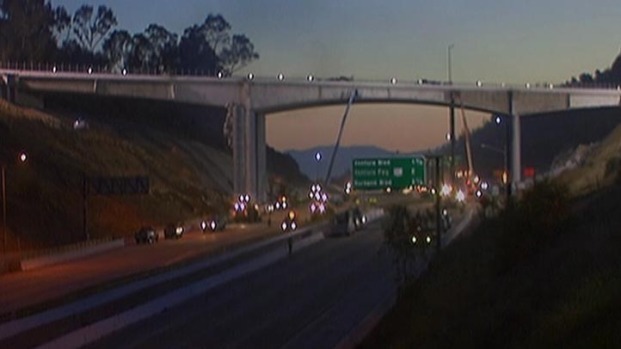 The 405 Freeway closure lasted 36 hours. Watch it in 40 seconds. Related Article: "Mission Accomplished: Carmageddon Ends"
Bejan Souferian raced home to West LA early from his Van Nuys security company, Scotland Entry Systems. He and Michelle heeded the warnings of officials to stay put. “We stayed home the whole weekend cause we worried, like everybody else, that we would get stuck,” Michelle said. Married for five years, the Souferians had been trying to get pregnant for the last 4.5 years. Then, came Carmageddon weekend. Could it be a Carmageddon miracle? Obstetrician Dr. Robert Katz will deliver the Souferian’s baby boy. The doctor said it wasn’t a miracle. Rather, it was a matter of taking the pressure off. Katz, who has been in practice 23 years, said couples who conceived that weekend would have a due date of April 9. Tommy, didn’t plan on having a baby. Then again, they didn’t have plans during Carmageddon. In just a matter of months, the 405 will be empty again. Yes, Carmageddon is coming back.